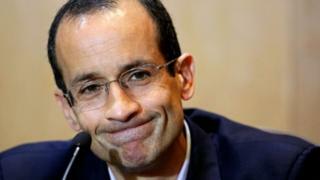 Marcelo Odebrecht, the tycoon at the centre of Brazil's big corruption scandal, has left prison to serve the rest of his term at home. The former head of the Odebrecht construction company was arrested in 2015 and given a 19-year jail sentence. He was found guilty of organising a giant political kickback scheme in dozens of countries. The remaining seven years of his sentence will be spent at his luxury home in Sao Paulo. He received a reduced sentence after agreeing to testify for the prosecution. The discovery of the Odebrecht company's corruption scheme has wreaked political havoc in dozens of countries across the Americas and beyond. Prosecutors are untangling a vast web of bribes to politicians in countries as far apart as Portugal and Mexico. In Brazil, around a third of the current cabinet including the President, Michel Temer, are alleged to have been involved. Odebrecht pulled back the curtains on a kickback scheme that was so huge it required its own dedicated department within his company to manage the bribes. For the next two and a half years Odebrecht will be strictly bound to his home, receiving only family and a small number of other visitors. But restrictions will be eased during the second half of his sentence. According to local media, his house is a 32,292 sq ft (3,000 sq m) property within one of Sao Paulo's most exclusive and heavily guarded gated communities. Odebrecht's company has also ended up agreeing to pay $2.6 billion in fines to the Brazilian, Swiss and US governments. Fallout from the scandal continued on Tuesday with the authorities revealing that documents handed over by Odebrecht showed that it formed a cartel to control the market for highway construction in Sao Paulo between 2008 and 2015. According to prosecutors a similar scheme was in operation for the construction of metro train lines in eight Brazilian states. Odebrecht SA is a family firm started by Marcelo Odebrecht's grandfather. It has built many significant projects across Latin America and the world including Olympic venues in Rio de Janeiro and a hydro-electric dam in Angola.